"Whales are this iconic example of evolution," Travis Park, an ancient whale researcher at the Natural History Museum in London, said. "They went from small hoofed mammals to the blue whale we have today. It's so interesting to see how they conquered the oceans." An international team of palaeontologists from Peru, France, Italy, the Netherlands, and Belgium excavated the fossil in 2011. 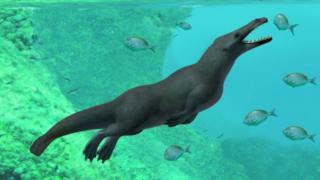 They have named it Peregocetus pacificus, meaning "the travelling whale that reached the Pacific".